The site goes on. I’ll be at home on a Sunday evening and wonder if I will have anything to write about in the coming week. I seem to find something almost daily. I did get some money from the ad experiment, which paid my WordPress extra storage fees for next year. I have to be happy about that! I was hoping to have some more EVE Online Blog Pack profiles to post, but that Crazy Kinux has been jet setting around with the “Who’s Who” of the EVE Online world. I hope we’ll get back to that this month. And then, of course, there were all the expansions that came out in November. Too many choices, not enough time. I was going on about MMOs on a single server again, focusing on EVE Online and why its unique set of circumstances allows CCP to get away with everybody on one shard. I was thinking about all that vendor trash that just disappears. I was moaning about EverQuest and accessibility again. I need to get over that. I hit level 60 for the first time in EverQuest II and was also claiming my four year veteran rewards. My daughter and I were playing LEGO Star Wars: The Compelete Saga on the Wii. And the instance group was finishing up Sunken Temple in a way that gave us a before and after snapshot of the WoW 2.3 patch. Please visit these sites that were kind enough to link here to help show my appreciation! Is There Hope for a Science Fiction MMORPG? With Northrend to explore and Norrath to revisit, I have not had a lot of time for EVE. My goal was to buy a freighter by Thanksgiving. Financially, I was set by that date, with a nearly a billion ISK set aside in reserve for post purchase economic activity. But with time limited, I have opted to run missions and such rather than haul trash. The nice thing about EVE is that once you have your sales position set, it will run for a while by itself, so ISK continues to come in. Meanwhile, I have been doing the usual training fun, sharpening up combat skills for both my main and my alt. Gaff, Potshot, White Kitten, and I have been back in EverQuest II for a while now. In general it has been a lot of fun, though I am surprised that, four years after launch and to machines later, I still run into performance problems in the game. I had to draw down the graphic settings (which were set to balanced) to be able to move smoothly through Nektulos Forest. And at peak hours the responsiveness of the game seems less than ideal. Press a button… wait a few seconds… action happens. Still, EverQuest II has a lot to offer. And being part of Revelry & Honor is great. 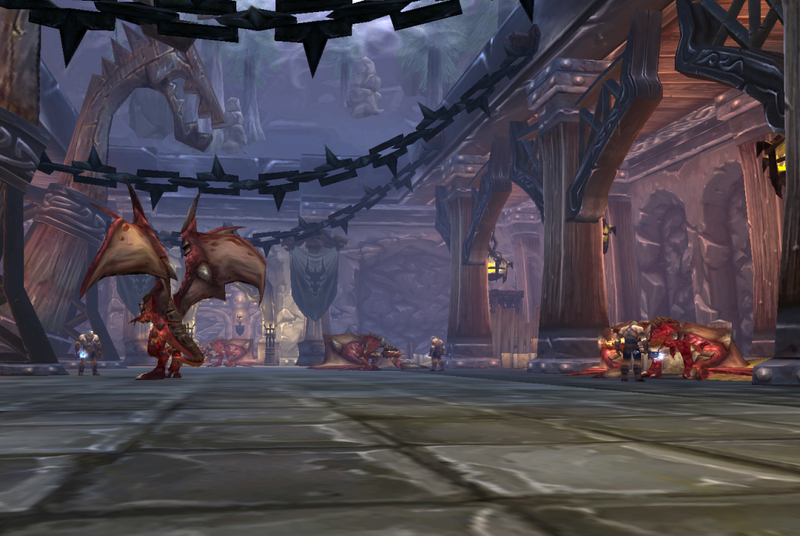 Having access to their guild hall… well… it almost feels like cheating. Plus it is the most amazing and opulent indoor location I have seen in the game. It takes as long to load as some zones. I just dread the day when it will be my month to pay the rent on the place. My 15 year anniversary with Toril MUD has spawned some nostalgia and a few posts, with a couple more to come. I have even played a bit with my friend Scott, who got me into the game way back when. I even managed to get in on a zone group today (for Cave City), which was very confusing after more than three years away. A lot of colorful scrolling text and me trying to figure out what to do. I don’t think I embarrassed myself too much in the effort. I only died once despite being somewhat lost the whole time. Wrath of the Lich King has really delivered. Was it worth nearly a two year wait? I am not sure. But it is fresh and smooth and funny and interesting and beautiful and many more things. Blizzard proves again why they are #1. 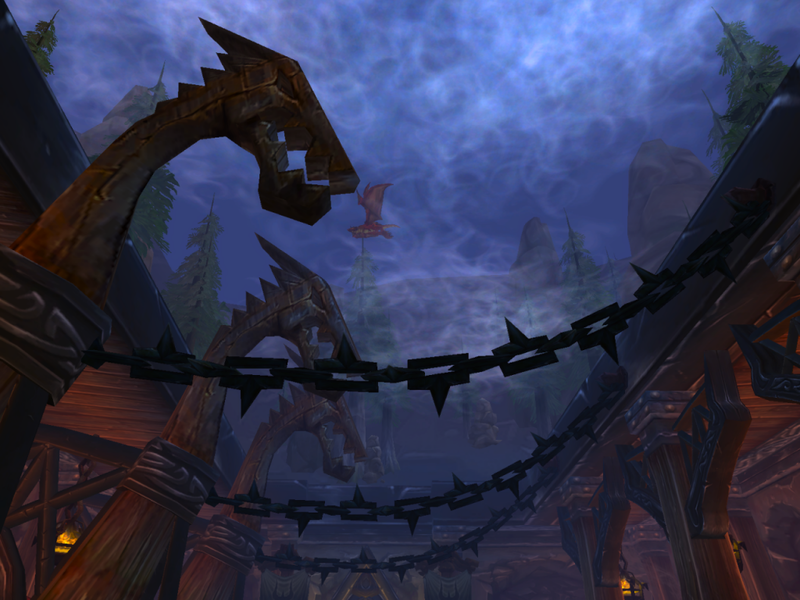 A bit more TorilMUD nostalgia as well as reports from Norrath and Azeroth. We’re coming up to the end of the year, so I’ll have to score my predictions for 2008. (Oh, and my EQ2 predictions as well.) Tobold isn’t running Blizzard yet, but there is still a month to go. And, if I get my act together and finish it, there will be another Christmas story. This entry was posted in blog thing, entertainment, EVE Online, EverQuest, EverQuest II, Month in Review, MUDs, Sony Online Entertainment, World of Warcraft and tagged TorilMUD on November 30, 2008 by Wilhelm Arcturus. Here is something (or something else, depending on your point of view) that World of Warcraft ought to copy from Warhammer Online. I hate that, in the talents window, that spending a talent point is complete and final the moment you click on it. There are no “take backs,” you’re done and if you made an error, you have to go spend some gold to fix it. In Warhammer Online, the equivalent window has a save button at the bottom, and no change you make is committed until you click that button. Of course, I did not actually click that button in Warhammer Online the first few times, having been trained by the WoW’s talents window (and EverQuest II’s alternate advancement window, which behaves the same way), but once I figured out why my selections were not sticking, I saw the advantage of Mythic’s method. Now maybe I am the only person to mis-spend a talent point now and again, but short of Blizzard giving us multiple talent profiles, some way to alter or confirm your selections before you commit them is a change I would like to see. This entry was posted in entertainment, EverQuest II, Warhammer Online, World of Warcraft and tagged talent points on November 27, 2008 by Wilhelm Arcturus. We logged on Saturday night around 9pm and were rewarded with Baby Blizzard Bears. Since we play on an East Coast time zone server, the day rolls over 3 hours early for most of us (Earl is in New York, so the time is right for him) so we got our bears a little earlier than expected. There actually seemed to be some oddity with the times because while Vikund got the achievement and bear before midnight local, logging in other characters did not. However, they all got their bears the following morning when I logged them in. So we ended up running around with five little bears in tow through much of the evening. And we were not alone. The bears were everywhere. The usual line up was on hand for the evening. None of us had hit level 71 yet. Nice stuff. I even left the show helmet option selected, since I like the sort of “Steampunk meets Shogun” look of it. Along with that, my own alt, Tistann went out harvesting leather so, with the addition of a substantial pile of hides from Ula, he was able to make some Borean Armor kits to further boost the stamina of some party members. That put both Earl and Vikund close to 14K hit points when buffed. With that bounty of new equipment for the tanks, we thought we might have a better shot at Utgarde Keep. We rolled in pretty well, as we did the previous week. We got through the forge area without issue and then the drake pens, which are also a nice setting that I did not post a shot of last week. I noticed this time around that the roof is “open” on the drake pens. Pretty quickly we found ourselves facing Prince Keleseth again. Get Him? That's You Plan? Unfortunately, the upgraded equipment on Vikund and Earl did not turn the balance quite enough. Both of us lasted longer when going toe to toe with the prince, but in the end, in four runs, we only got him down to 50% health before wiping. The casters, who bear the brunt of Keleseth’s ice block, were hard pressed to stay alive and provide the damage needed to bring him down. 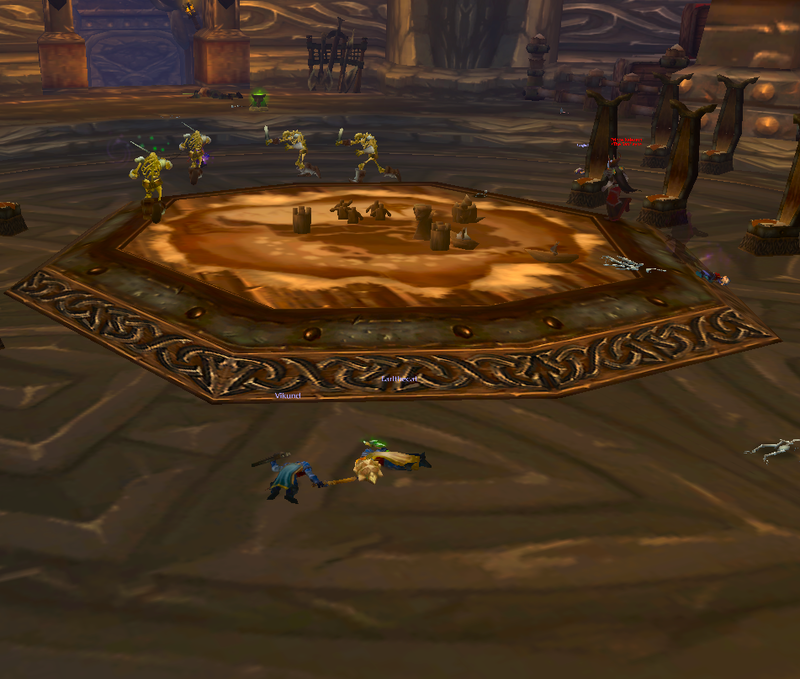 Skronk did hang in better than last week, ending up the last dwarf standing twice. But staying alive, un-frozen, and keeping everybody alive was a bit too much juggling. So after the same result four times running, we decided to go do some quests to upgrade gear further. Rumor has it that some of us are still wearing gear obtained early on in Hellfire Peninsula. (No, don’t go to the Armory and check, it’s embarrassing enough.) Then to do some research on how other groups are going after Prince Keleseth. Advice here is, as always, welcome. But if your own experience starts out with having the Warbringer Armor set or some such, it probably isn’t going to help us much. We are strictly quest drops and auction house level of equipment. This entry was posted in entertainment, Instance Group, World of Warcraft and tagged Utgarde Keep on November 26, 2008 by Wilhelm Arcturus. The wonder of EVE is not only figuring out what you want to do, but then figuring out how you get there, how much it will cost, and how long it is going to take. So when I noted that my mining alt had evolved into a decent combat alt, it was suggested by Andreaz that I look into Command Ships as a possible path forward for him. That meant it was time to crank up everybody’s favorite EVE Online toys utilities, EVEMon and the EVE Fitting Tool. Some days I am in those two more than I am in the game. There are two Caldari Command Ships, the Vulture and the Nighthawk. I picked the Vulture to work with. A quick mock up of a Vulture with the fittings currently on my Drake showed a good 45% boost in effective shield strength. Granted, I lose two missile launcher hard points, but that much of a boost over an already awesome low maintenance shield tank makes it all worth it. This is a ship worth having. Then I had to look into the cost. Being a tech II ship, I gave up on any idea of building it myself. I would need a couple of long skills to manage that, so I started pricing Vultures on the market and available via contracts. From that it looks like a Vulture is somewhere between 105 and 130 million ISK. More expensive than, say, a Raven, but on par with a Rokh both in price and coolness. Finally, I made it to the usual EVE back-hand slap. I want it today, I can afford it today, but when can I fly the damn thing? If I keep on the true path of training, let not a minute got to waste between skills, and do not get distracted by other wants and desires, I can fly a Vulture on January 21st, 2009. That’s the way things go in EVE. At least I was already well into one of the two long skills in the training plan. In fact, I just wrapped up Battlecruisers V this morning and started on Caldari Cruiser V, a 21 day skill to overcome. The next longest skill on the list is Long Range Targeting V, which comes in just over 8 days, and then skills fall into a pile of four days or less cycles. And, of course, if I am going to bother with a command ship, I should go all out and get the warfare link modules going along with the associate implants. I can get the first one fully up and running by some time in March of 2009. EVE is a game of long term goals, and I had no other plans for my alt in any case. This entry was posted in entertainment, EVE Online and tagged Command Ships, Drake, EVE Fitting Tool, EVEMon, Vulture on November 25, 2008 by Wilhelm Arcturus. While I have been impressed with life in Northrend and how things are going with Wrath of the Lich King, I have not been playing a lot. Non instance group nights have been mostly spent in EverQuest II, exploring Norrath from the Freeport perspective. Still, I do find myself in Azeroth now and again, chasing down quests that do have a bit more spark and flair than your average “kill 10 foozles” routine. Among other things I’ve been bombing pirates from a captured horde airship and out hunting with a train falcon. And, amongst the fun, I found my hunter, Tistann, suddenly level 71. Of course, a few minutes later I ran into a level 80 death knight. There was somebody who managed 25 levels in the time I did one. It isn’t a race, however… well, not since all the server first achievements got finished up. 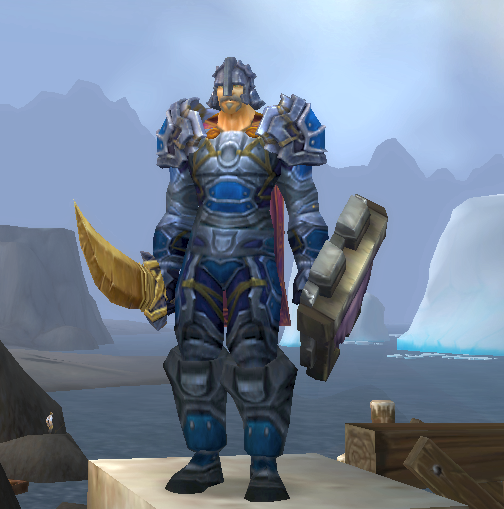 I’m just enjoying the time I spend in Northrend. This entry was posted in entertainment, World of Warcraft and tagged levels, Northrend, Tistann on November 24, 2008 by Wilhelm Arcturus. I chuckle whenever I see that name. I know it should probably be pronounced Ahr-shat, but I cannot help but pronounce it Arse-hat in my head. Then I think about how many of the people talking on Local must have grown up in that system. This entry was posted in entertainment, EVE Online and tagged Arshat on November 24, 2008 by Wilhelm Arcturus. The new expansion for The Lord of the Rings Online, The Mines of Moria, has been overshadowed by the release of Warhammer Online (and its tribulations) and the huge Wrath of the Lich King launch, so personally I had little idea of what the expansion entailed beyond very general information. G4TV‘s MMO Report went out to interview the LOTRO team at Turbine and came back with some really good stuff. In part one they talk with the team about Moria itself, its design and vast scale. It is enough to get you excited about the expansion. Find part one of the interview here. This entry was posted in entertainment, Lord of the Rings Online and tagged Mines of Moria, The MMO Report, Turbine on November 23, 2008 by Wilhelm Arcturus.